Land Rover Hinsdale is proud to announce that one of their long-time Sales Guides, Dan Gallovitch, has been selected by Jaguar Land Rover North America as a winner of the 2013/14 Guild Competition. This designation is only given to the best of the best, and rewards the Sales Guides who have top sales and customer satisfaction statistics. I was very excited to be recognized for something I enjoy doing so much. I truly love what I do and it is overwhelming to be rewarded for something that I do every day. I have always loved working at Bill Jacobs. Land Rover Hinsdale is proud to announce that one of their long-time Sales Guides, Dan Gallovitch, has been selected by Jaguar Land Rover North America as a winner of the 2013/14 Guild Competition. This designation is only given to the best of the best, and rewards the Sales Guides who have top sales and customer satisfaction statistics. Dan has received an invitation to the Journey to Excellence Guild Trip taking place September 11 - 17, 2014 in the UK for his achievements. Dan was born and raised in Illinois and has been with Bill Jacobs since September 1994. He has been through multiple training and pilot programs with Land Rover, and is trained and fluent in all models. 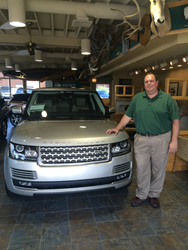 He enjoys working for Land Rover Hinsdale, and loves the Land Rover brand. This is an opportunity only granted to select Sale Guides who have ranked highest among their peers on the 2013 performance metrics. To qualify, candidates for this competition must have earned their 2013 Gold Certification, and must have met all requirements for Land Rover Master Status. The top 15 Land Rover Sales Guides from across the United States who scored highest in this year’s competition were selected as the 2013/14 Guild winners. These Sales Guides have all received an invitation to the Journey to Excellence Guild Trip, where the single highest scorer among them will be presented with the coveted Marque of Distinction award. Part of Bill Jacobs Motorsport, Land Rover Hinsdale takes pride in delivering a level of customer satisfaction beyond your expectations. They create a shopping experience that matches the luxury products they represent. Professional, well-informed, friendly Sales and Service representatives build one-on-one relationships with each customer. Land Rover Hinsdale is proud to be the #1 Certified Pre-Owned sales volume leader in Illinois. (Land Rover May 2014 monthly sales report). Bill Jacobs is a name you can trust, and has been in the automotive business for over 50 years. For more details, please call Bill Jacobs Land Rover Hinsdale at (866) 857-7638 or log on to http://www.landroverhinsdale.net.